Peter Salem standing behind Thomas Gosvenor in "Death of General Warren at the Battle of Bunker Hill"
Peter Salem was a Patriot of the American Revolutionary War, who spent two months fighting alongside his former owners at the Battles of Lexington and Concord in Massachusetts. Salem is credited with killing British Major John Pitcairn during the Battle of Bunker Hill. Peter Salem was born enslaved in Framingham, Massachusetts, on October 1, 1750. He was owned by Army Captain Jeremiah Belknap and spent most of his early life working on his owner’s farm. Early in 1775, Salem was sold to a Patriot soldier, Major Lawson Buckminster, who emancipated Salem so he could enlist in his regiment of Massachusetts Minutemen. By April 1775, Salem was in Colonel John Nixon’s Fifth Massachusetts Regiment and was assigned to Captain Thomas Drury’s company of Minutemen who received word that British forces were marching on Concord to seize the colony’s military supplies. 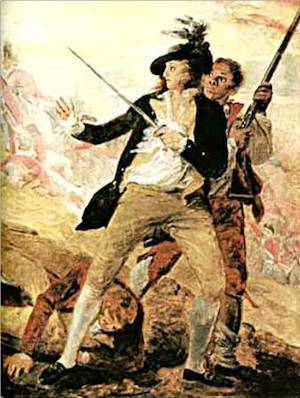 The Minutemen met the British in the first battles of the American Revolution. Salem fought alongside mostly white soldiers, but the company also included other African American minutemen: Titus Coburn, Salem Poor, and Seymour Burr, all of whom fought at the Battle of Bunker Hill. It was at this battle that Salem was credited with delivering the fatal shot to British Major Pitcairn. The 1787 painting “The Death of General Warren at the Battle of Bunker’s Hill” showed Peter Salem with a musket behind Patriot Thomas Grosvenor just after he has delivered the fatal shot to Pitcairn. That painting hangs in the Rotunda of the U.S. Capitol in Washington, D.C. Salem received a commendation from the Massachusetts General Court for his bravery at Bunker Hill. Major General George Washington had first issued an order forbidding African Americans from enlisting, but when Washington heard that the Royal Governor of Virginia, Lord Dunmore, had promised freedom to all Patriot slaves willing to enlist in the British Army, he canceled the order and sent out “The Call to Arms” among African Americans. Salem re-enlisted for another year in the 4th Continental Regiment which fought in New England, New York, and New Jersey. After serving a total of four years and eight months, Salem was discharged on March 1, 1780. Now a civilian again, he worked as a cane weaver, built a home in Leicester, Massachusetts, and married Katy Benson in September of 1783. The couple had no children, and the marriage was dissolved by the time of the 1790 census. Afterward, Salem struggled to earn a living the rest of his life, trying his hand at gardening, basket weaving, and the making and repairing of chairs. Peter Salem died on August 16, 1816, at a poorhouse Framingham, Massachusetts, at the age of sixty-six. In 1882 the townspeople of Framingham, Massachusetts, erected a monument in his memory at his burial site at the Old Burying Ground in Framingham. George Quintal Jr., “Patriots of Color, A Peculiar Beauty and Merit': African Americans and Native Americans at Battle Road and Bunker Hill,” Boston National Historic Park, Boston, Massachusetts; “Peter Salem,” in Leslie Alexander, Encyclopedia of African American History, (ABC-CLIO, Santa Barbara, CA, 2010); “Peter Salem,” in Jonathan Sutherland, African Americans at War: An Encyclopedia, Volume One,(ABC-CLIO, Denver, Colorado, 2004).